The British National Party's (BNP) leader, Nick Griffin, appeared on the BBC's flagship news show, Question Time today. [A full account, as well as several minutes of film footage, are available on the Guardian website.] While the appearance generated considerable protest—some 1,000 protesters convened outside the BBC studios—here at The Nationalism Project, we found ourselves wondering about taxonomy. The BNP often draws fire as racist and is frequently equated to the Nazis; indeed, Griffin is well known as a Holocaust denier. Despite recent claims that the BNP would soon abandon a racial qualification for membership, the party seems to represent a clear example of "ethnic nationalism." Whereas "civic nationalist" groups such as the Scottish National Party (SNP) base their political platform on economic, and occasionally cultural, issues, the BNP offers an array of political arguments that are racial in tone. 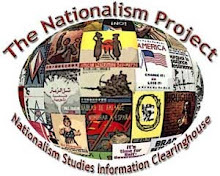 Of course, from an academic perspective, it is often difficult to classify nationalisms. On the surface, it is easy enough to declare that the BNP represents ethnic nationalism, the SNP civic nationalism, Siol nan Gaidheal cultural nationalism. But where should such a matrix stop? If the SNP includes some cultural content, does that make it a cultural nationalist group? How much racial content is necessary before a group becomes "ethnic?" Do nationalist parties need to be classified according to a Venn diagram? What of liberal nationalism, ressentiment nationalism, and exclusionary nationalism? Are there a nearly limitless number of sub-genres of nationalism? At what point does endless classification become useless from a scholarly, let alone a popular, perspective? Such questions may not seem relevant when discussing a group like the BNP. Their rhetoric speaks for itself. Yet the dialogue put forward by parties such as this one virtually begs for us to develop a clear classification system. While few parties will actively state: "We're racist!" the public needs to see past such rhetoric and to fully understand what it is looking at. To foment such understanding, scholars need to agree upon a language for analysis. The philistine dialogue taking place in the United States about "socialism" (which apparently means widely different things to different people!) should not be applied to nationalism. The stakes are all too painfully high.